Certainly thoughts of Salisbury steak do not conjure up, at least for me, images of Civil War era health food–especially if you were a product of the 60s or 70s, when TV dinners were quite the novelty and the ultimate splurge for both the busy parent and the Sesame Street set. If it wasn’t fried chicken, it was Salisbury steak, tucked into a divided foil tray, where the main dish, along with potatoes, a veg medley, and a dessert all co-exist without ever mingling. I imagine this is not what Dr. James H. Salisbury had in mind when he invented the dish back in the 19th Century. After conducting his own studies, Dr. Salisbury concluded that a diet high in animal protein was best, and his steak made of finely minced meat was the centerpiece, thus creating one of the very first fad diets. So how does Richard Simmons fit in?Â Funny enough, it was a combination of Salisbury steak, along with a nudging mother, that led to an epiphany for Richard–how long would it take to burn off his dinner? Ultimately, he decided calories were not something to fear but rather something to respect. Richard, not being a fad diet kind of guy, went on to become one of the most popular health and fitness gurus around, and I had the honor of working at one of his Northern California Anatomy Asylums. What you can’t see here are all the fabulously bright 1980s leotards, tights, and leg warmers! 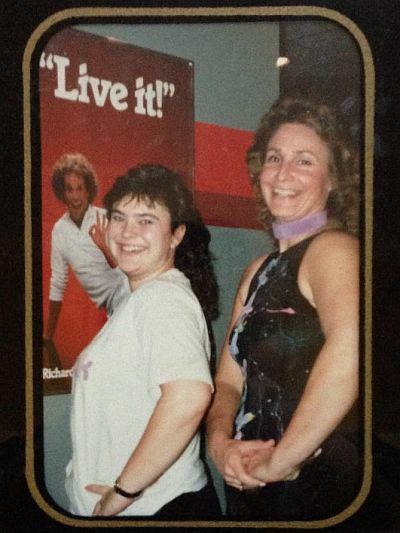 Penny, my then mentor and now long-time friend, showed me the ropes of teaching aerobics. While the Salisbury steak is not really a health food, as Richard surmised, it’s not all bad either. Just start with some lean ground beef, and there’s really not much else to it. I try to keep the patties on the thick side, so they don’t accidentally overcook. This version was adapted from an old Campbell’s Soup recipe, adding an extra layer of melt-in-your-mouth onion goodness. Variations are fun too, whether you want to toss in some mushrooms or a splash of red wine, this hearty fare will satisfy any family. Just add your favorite mashed potatoes, maybe a tossed salad on the side, and this easy meal is on the table in no time! 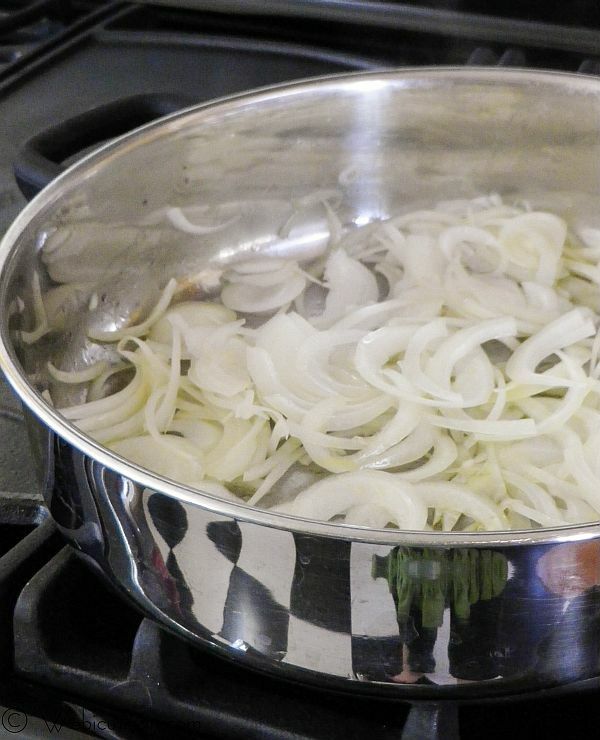 This dish is super easy, and adding the extra onions really makes a difference.Â Start off by sauteing the onions in the olive oil until they start to brown. Add the beef patties, brown on both sides, then stir in the remaining ingredients to make the gravy. Cover and simmer until done. Easy peasy. Serve with some mashed potatoes to soak up some of that yummy gravy. Heat the olive oil over medium heat in a large skillet. Add the onions and saute, stirring continuously, until they begin to brown. Meanwhile, in a large bowl, combine ⅓ cup of the soup with the beef, bread crumbs, egg, garlic, salt, and pepper. Once thoroughly combined (you may need to use your hands for this), divide the meat mixture into six equal parts and shape into oval patties. Push the onions to the edges in the skillet and add the patties. 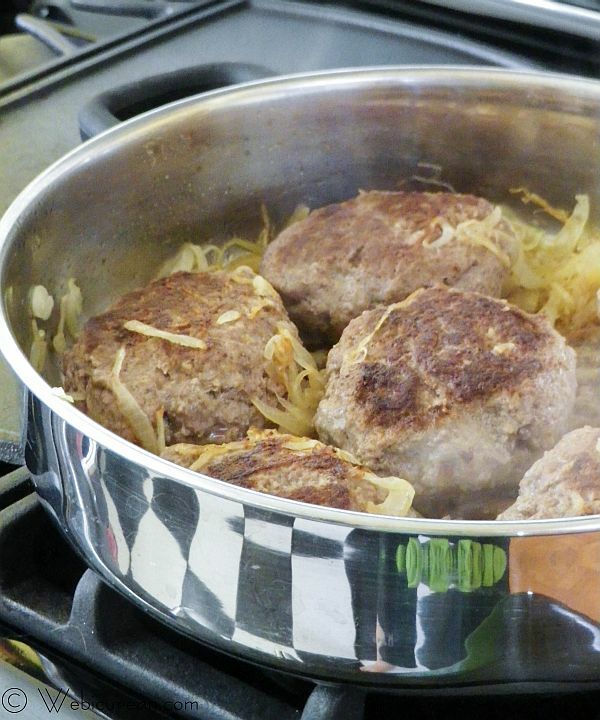 While the patties are browning, in a small bowl, combine the remaining French onion soup with the rest of the ingredients. Once the patties are browned on both sides, stir the soup mixture into the pan, deglazing/scraping any stuck bits from the bottom. Cover and cook over low heat for an additional 15-20 minutes, or until done. Let’s get this retro party started–seriously! Bookmark this page, and let it be the launching pad for your next shindig. For those of you in warm weather, maybe a retro garden party could be your theme. Snowbound? No problem, go old school ski lodge with your theme. The possibilities are endless, and #SundaySupper has you covered, from appetizers and cocktails, to desserts and everything in between. 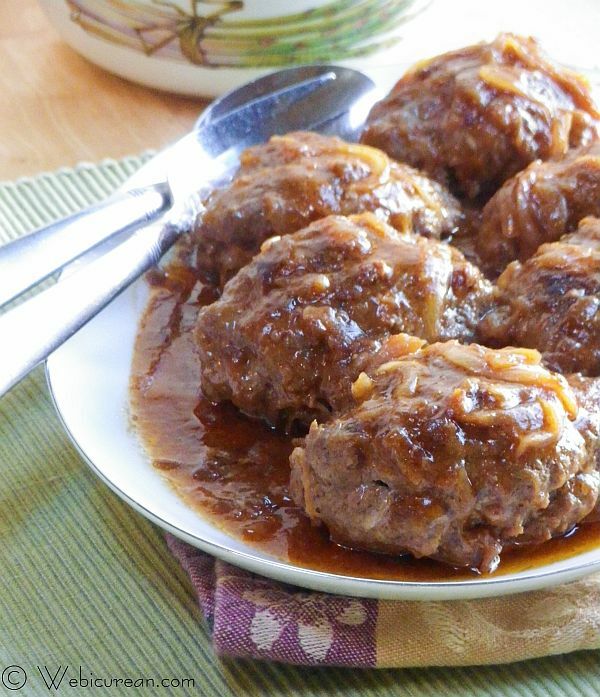 Heck, even my Salisbury steak above can be turned into meatballs for a cozy winter appetizer! Those photos of Richard Simmons are so great! And so is your recipe. Such a classic dish. I’m not a fan of the Salisbury Steak I usually see but I love that you made it with onion gravy. Now that sounds good. My mom would buy those frozen tv dinners and salisbury steak was always a favorite! These look so much better!!!!!!!!!! I can’t believe I never had my first salisbury steak until I met my husband cooked by his grandmother and I never made my first salisbury steak until this past year! I love your version but I love your photos better!!! Such cute old photos!!! And your salisbury steak looks fantastic—pure comfort food! How great to see that you posting again! 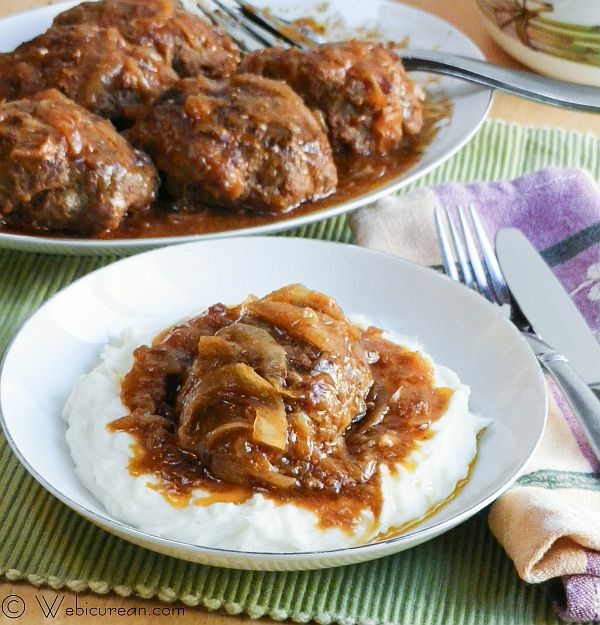 Toby often mentions a Salisbury steak recipe that he used to make years ago — we will have try your version. Thanks! I’ll have to give you a call later. Toby may have made something similar–this recipe has been around for years and originated on a soup label! 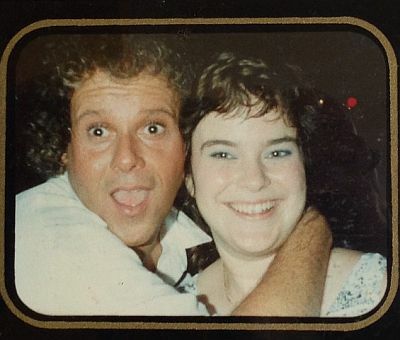 Salisbury Steak and Richard Simmons…..that really is a blast from the past. I think when I was a kid salisbury steak was my favorite tv dinner (now there’s retro for you) and I think it came with mashed potatoes, corn and a brownie. All inside it’s little space ship aluminum foil container. LOL I know so much better now that I have grown up and tasted real food from scratch. Haha! Thanks for sharing! I remember really really liking that warm brownie! Sometimes I’d eat it first just to make sure it was still warm! These look delicious! One of my favorite comfort foods…. 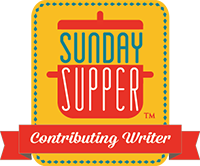 This Sunday Supper is my first in ages too, and I think only my 3rd blog posting at all since my second was born last year. I also haven’t thought of salisbury steak in years and now think it is something that will go on my meal plan for next week. I forgot how simple and delicious this is and like you said made with lean meat isn’t too bad for you. I definitely think you need to give this a whirl! How does it feel to be back? I’m cracking up over your post! Richard Simmons! I had leg warmers too!! This dish so reminds me of childhood and looks even better than what I remember! I think I’m forced to make this for my kids; they would LOVE it! I think there’s a box somewhere downstairs that contains my flashy dance burgundy legwarmers with sparkly golden threads woven throughout! Yum yum and MORE yum! This is a retro food that has never gone out of style at my house 🙂 yours is gorgeous!! I’ve never made salisbury steak at home, I’ll have to rectify that soon! Love it! I had salisbury steak for the first time fairly recently – and loved it. I like that your gravy is an onion gravy, I’ll have to give this version a try. This looks so good. This is exactly what I was craving for dinner. Maybe I’ll make it tomorrow night.